October 2, 2019 is SOLD OUT! You can still book the Provence Untour for these dates, but without Wine & Food activities. 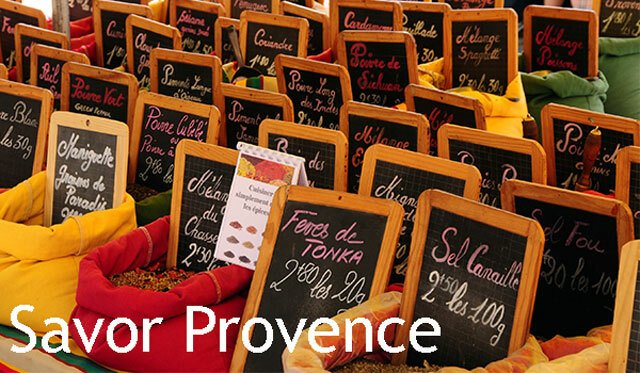 Wine & Food activities can be added to any Provence dates for a group of 4 or more. Inquire about costs. Also, there are still openings for Tuscany's Wine & Food Untour. Here are the activities that are included in the Provence Wine and Food Untour. This is a sample itinerary. Wednesday: Arrival in Provence, time to settle in and explore. Thursday: Untours orientation session, followed by traditional Provençal lunch and free afternoon. Friday (or Monday*): Morning market tour, cooking class, and lunch with a local chef. Saturday: Private wine tour and tasting. Join our private winery tour, which includes transport by van with small groups of 7-8 people. Visit the cellars of 3 wineries near Beaumes de Venise, Gigondas, and at Châteauneuf du Pape. Meet the winemakers! Along the way you will learn about the local varietals, winemaking traditions in the area, and the taste profiles of the region’s wines. Sunday and Monday: Time to explore on your own. Tuesday: Morning tasting tour of Avignon with free time to explore in the afternoon. This guided walking tour of historic Avignon includes stops in some of the best small, local shops and bakeries to taste croissants, chocolates, coffee, and fougasse. There is a wine tasting, and then a visit to Les Halles that includes a savory tasting of tapenade, sausage, cheeses, breads, and seasonal fruit. Groups size of up to 12 people. Wednesday: Depart for home, or relax and stay another week. Please note that this schedule is subject to change at any time, based on number of participants, availability and season.